So tell me, when you see a strange esoteric diagram and are told that each layer of it is guarded by so many deities, do you secretly think that this is all weird mumbo-jumbo? Do you tell yourself that yes, there may well be a God, but all these strange tantric ideas are not quite your thing? That you are too scientific or practical minded to think that the Goddess is in a bindu surrounded by nine layers in a diagram, each layer guarded by many more deities? I am, of course, talking of the Sri Chakram that I referred to in my first post for Navaratri yesterday. The thing is, I quite sympathise with you if you find it a bit difficult to relate to. I too am of a scientific bent with a questioning, logical and rational way of thinking, with a mind which is often taken aback at some concepts and ideas which are well within these diverse set of beliefs which we call Hinduism. But let me offer you something to think about today. 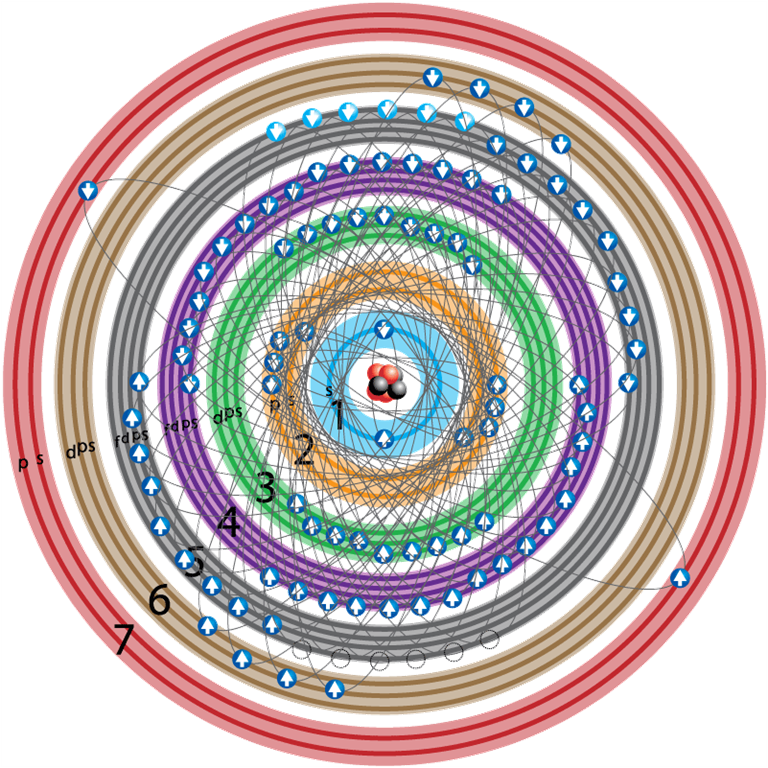 I present to you the PluChakram below where there are seven Avaranams (enclosures) guarded by 94 gupta (secretive) devis who are forever moving. At the centre are 94 Shaktis, matched by 150 Shivas. When separated, they become their rudra or angry form capable of destroying the earth. Well, what do you think? Am I talking mumbo-jumbo? Not really. This is just the structure of Plutonium (reference) described with a bit of artistic license! I am, of course, talking of electrons and orbits, of protons and neutrons and nuclear energy. Is it any less of a truth just because it is thus presented? 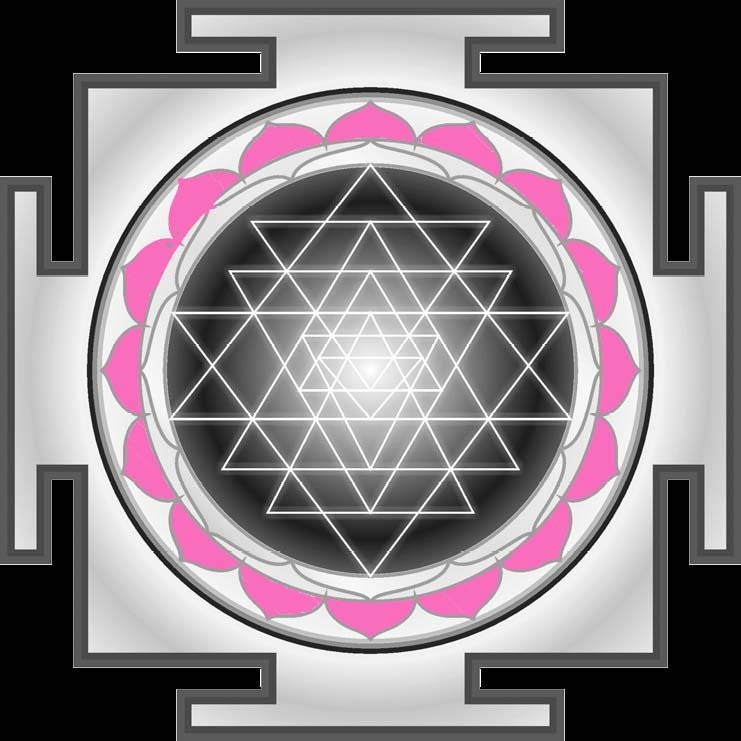 I just want to make the point that the Sri Chakra too is a diagram representing a powerful force. Perhaps we don’t understand it too well but that doesn’t mean we should reject it either. So we come to today’s kriti, in honour of the second Avaranam, a lotus shaped enclosure with 16 petals called the सर्वाशा परिपूरक चक्र Sarvasha Paripooraka Chakra (the fulfiller of all desires). The presiding deity is Tripureshi and there are 16 Devis who rule this Avarana. Dikshithar’s kriti in honour of this Avarana is set to the very beautiful Kalyani raga. Presenting this kriti is the young Sriranjani Santhanagopalan (from 8:57). I would also like to present U.Srinivas’s beautiful rendition in his memory; his loss weighs heavily on my heart. Worship (bhajarE) Goddess Kamalamba and abandon (tjajarE) all that is the imaginary (kalpita) result (kAryam) of illusion (mAya) , O Mind (mAnasa)! She is paid homage to (sEVita) by Lakshmi (kamalA) and Saraswati (vEnI) beside her (pArshvam). The beauty (implied) of her neck (grIvAm) surpasses (jaya) that of a conch (kambu). She is bowed to (nata) by the Devas. She resides (sadanAm) in Kamalapura, the lotus-city. Her speech (gadanaAm) is gentle(mRdu). She has beautiful (kamanIya) teeth (radanAm). Her face (vadanAm) is like a lotus (kamala). She is the mistress (svAminIm) of the Chakra which fulfills all desires (sarVasha paripUraka chakra). She is beloved to (kAminIm) to supreme (parama) Lord Shiva. She is the secret (gupta) Yogini worshipped by (archita) by Sage Durvasa. She is the destroyer (dhvamsinIm) of sorrow (duhkha). She contains the universal soul (hamsinIm). She is the bestower (pradAyinIm) of true (nija) bliss (sukha) in the form of salvation (nirvAna). She is the ever (nitya) auspicious one (kalyAnIm). She is also Katyayani (the sixth form of Durga born as the daughter of Sage Katyayana) amd Sharvani (consort of sharva=Shiva). Her (vEnI) is darker than (vijaya=conquers) the colour (implied) of bees (madhupa). She is the mother (jananI) of the good (sad) Lord Guruguha (Kartikeya, also signature of composer). She is the unblemished one (niranjanI). She is one who destroyed (bhanjanI) of the egoistic (garvita) demon (asura) Bhanda. She delights (ranjanI) deities such as (Adi) Kamakarshini. She is the embodiment (rUpinI) of the absolute (nirvisEsha) consciousness (chaitanya). She is the manifestation (svarUpinI) of heaven &earth (urvI), reality (tatva) etc (Adi). Wonderful – your exposition of the “Pluchakram”. You are absolutely right – just because we don’t understand something , it doesn’t mean it is to be rubbished. Equally, to blindly follow something without some degree of thought is also inappropriate. Where the balance is to be sought, is each person’s call. I remain uncomfortable with somebody trying to impose his idea of balance on others – something which people at both extremes do. Sriranjini sings well and for sometime I have been “blaspheming” loudly that the father must retire and simply let his daughter take over !! Its difficult to listen to Srinivas’ recordings these days without a lump in the throat. I am glad you liked my Pluchakram 🙂 That balance that you talk about, I have thought about that often. When and how to draw the line between belief and understanding for myself ? And as to those who try to impose their ideas on others, I absolutely abhor them! Force of any kind is abhorrent..
Sriranjani sings quite well, doesn’t she? Still some maturing needed of course but she has made an excellent start. I saw her first in some competition in which her father was in the judging panel..